See how to format your entire paper in APA. Explanations are provided for each item. See the layout of a References page and how to insert in-text citations. 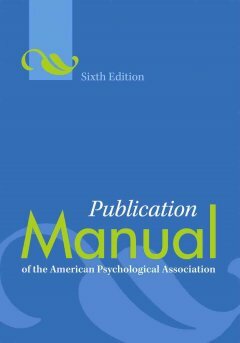 American Psychological Association (APA) style is commonly used for citing references in science and social science courses, such as Nursing, Psychology, Education, and Social Work. Double-space your entire paper, including the References list and any block quotes. The preferred APA typeface, or font, is 12-point Times New Roman. Once your paper is complete, number the pages consecutively, beginning with the title page. Include a "running head" on each page (p. 229). On the title page, use the format "Running head: EXAMPLE OF TITLE" (without the quotation marks). On all subsequent pages, use the format "EXAMPLE OF TITLE" (without quotation marks). See the sample paper on p. 41 of the Manual. Tip: Use the "header" function on your word processor to set up the page numbers and running head. Since the running head format is different on the title page than the subsequent pages, you will need to choose "different first page" within your word processor header function. This guide is a derivative of the APA Citation Style 6th Edition guide by Red Deer College Library. It is licensed under a Creative Commons Attribution-NonCommercial-ShareAlike 4.0 International License.